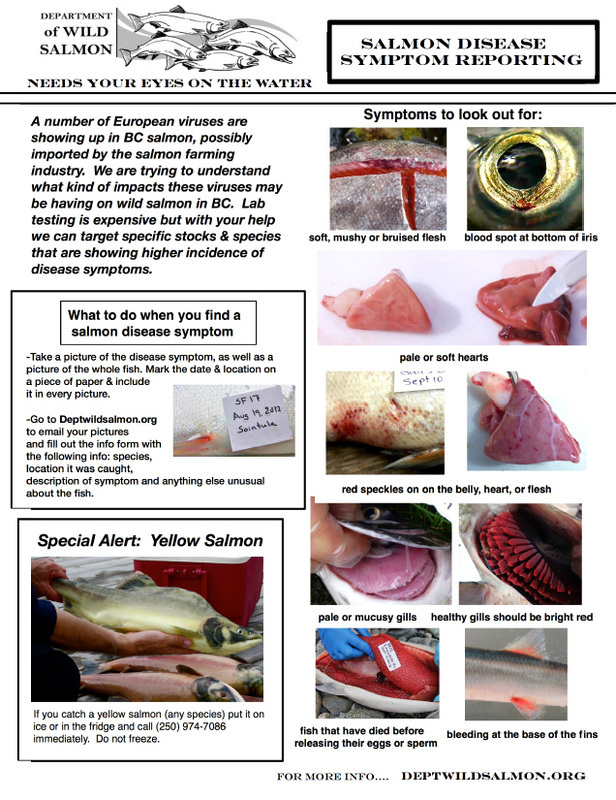 Dr. Alex Morton, biologist, tested and documented positive PRV and ISA virus infestations in farmed and wild salmon. The viruses have now spread to wild BC Canadian salmon. 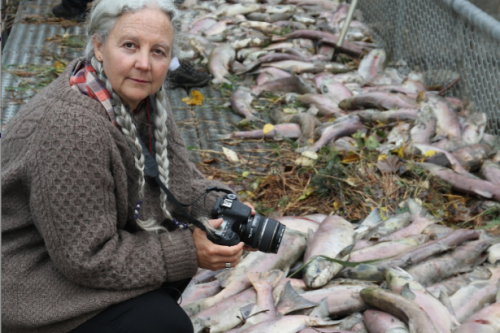 Dr. Morton just filed a lawsuit against Canadian Federal government and multi billion dollar Norway based Marine Harvest Hatchery for doing nothing about the spread of viruses and massive wild salmon loss. Federal response has been to block testing by passing laws that make it illegal to report positive tests. Campbell’s video shows a pinkish-red cloud being emitted by a pipe outlet from the plants. Campbell had the effluent tested and found evidence of Piscine Reovirus (PRV) which causes the disease HSMI. HSMI damages the heart and skeletal muscles of salmon. The samples he collected were sent to the Atlantic Veterinary College in Charlottetown, P.E.I. The testing was done by Prof. Fred Kibenge. Campbell said the point of his video is not to demonize Brown’s Bay Packing or Lions Gate Fisheries. They are not doing anything illegal. The focus is on Fisheries and Oceans Canada (DFO) and their “inability to manage and regulate or protect wild fish,” Campbell said. B.C. Environment Minister George Heyman is also aware of the video. Sick salmon don't eat. 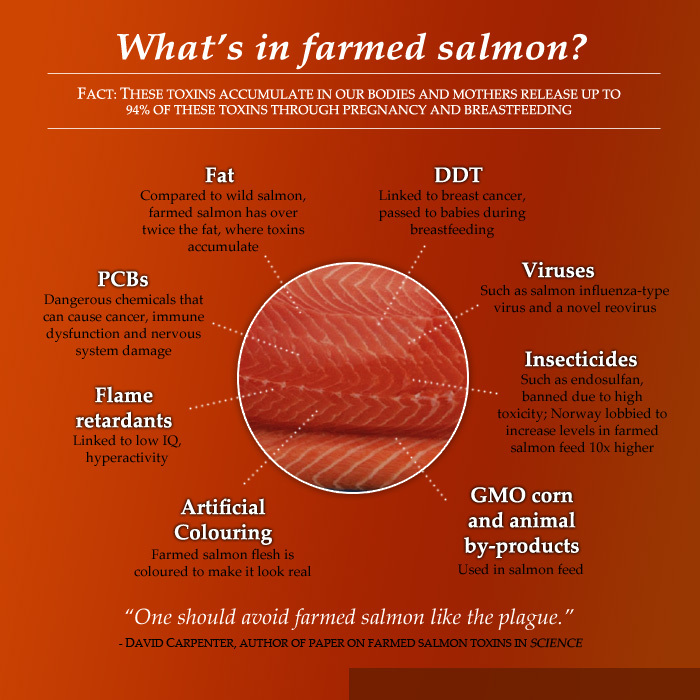 Salmon should not be skinny or have lesions so check before buying. Dr. Alex Morton has been fighting for 20 years against to destruction from salmon farming operation in BC Canada. 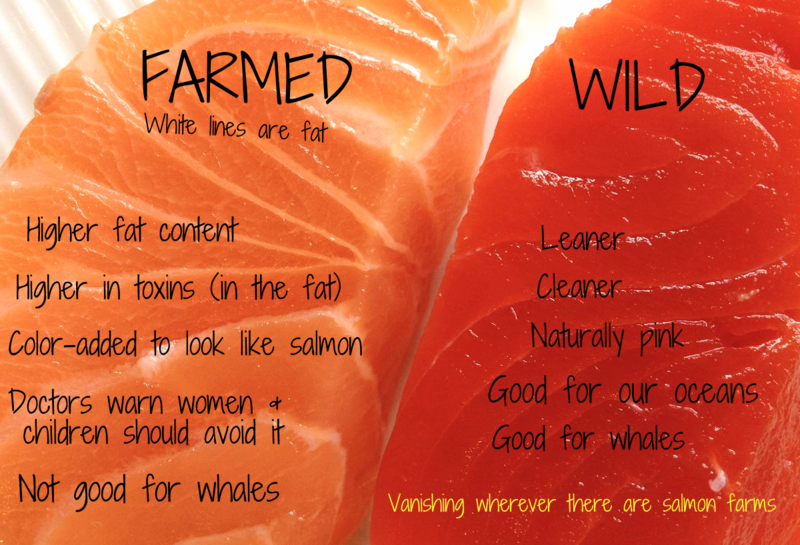 CAN YOU TELL THE DIFFERENCE BETWEEN FARMED AND WILD SALMON? What is piscine reovirus (PRV)? Piscine reovirus was discovered in 2010 and is thought to cause a severe infectious fish disease known as Heart and Skeletal Muscle Inflammation (HSMI). 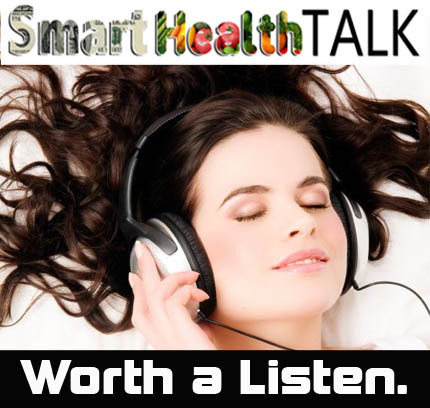 What is Heart and Skeletal Muscle Inflammation (HSMI)? HSMI is an infectious disease syndrome first observed in farmed Atlantic salmon in a single fish farm in Norway in 1999. There are now 419 farms infected with HSMI in Norway. 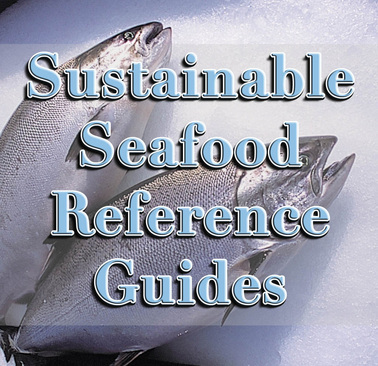 HSMI is listed as the #2 killer of Marine Harvest farm salmon worldwide. Not all fish that develop HSMI die from the disease. 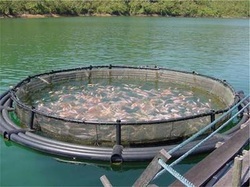 Farm salmon with the disease,HSMI, are seen lying on their sides on the bottom of the net cage still alive, but too weak to move. Farm fish with HSMI may recover, but wild salmon with HSMI would be extremely vulnerable to predation if found lying on their side, on the seafloor. In 2010 scientists at Columbia University, and from Norway, identified the piscine reovirus as potential causative agent of HSMI. The symptoms of HSMI occur 5-9 months after seawater transfer. Therefore, smolts leaving the Marine Harvest hatchery infected with PRV would not have appeared sick. Not all fish that test positive for PRV develop the disease HSMI. In fish farms, the PRV positive fish appear to develop HSMI after entering the net pen - perhaps due to the addition of another external factor such as stress. Salmon caught in the Broughton Archipelago in 2008 and frozen for research purposes tested negative for PRV. In 2012, fish from the same region tested positive for the virus. The scientists that uncovered the association between PRV and HSMI warned “it is urgent that measures be taken to control PRV … due to the potential for transmission to wild salmon populations.” He cautions that “if the potential hosts [fish] are in close proximity it goes through them like wildfire”. Given what we already know about PRV and HSMI, it is imperative that we proceed with caution and take steps to isolate fish infected with PRV from healthy wild salmon populations. Click to read full Dr. Mercola article.